Gameplay: This point and click game comes in 2 CDs. After installation, Nancy Drew Central frame is seen. This where any of the installed Nancy Drew Games can be started, get Nancy Drew information through the internet as well as the HerInteractive forum and store. After selecting The White Wolf of Icicle Creek, click on the Play button to start the game. To exit this frame, click on exit at bottom right. You will then select to play either Junior or Senior level. The main screen has pictures at the bottom of the page. The bag at left is the inventory link. The journal shows Nancy's notes about the present case. The checklist shows what needs to be done or was done in the case as well to progress in the game. The gear icon shows the options. Here the voice, effects and music volume can be adjusted. Also, the bottom background can be changed. Closed captioning selection is also in this page. The Load folder has the list of the saved games that can be replayed. The diskette is used to save the game. The rightmost icon closes the game and goes back to the ND Central frame. Open the case file and learn about the present mystery to solve. Head to Icicle Creek Lodge in the Canadian Rockies of Alberta, Canada to figure out many accidents have been happening there. Chantal Moique runs the lodge. Ollie Randall, the handyman will meet Nancy at the airport. A wolf was mentioned in the conversation. 8:35 PM. Talk to Ollie Randall. Hear a faint howl and then an explosion. The bunkhouse exploded. 9:00 AM. Ollie and Nancy talk to Chantal on the phone. Nancy will be the new maid as well new cook. There are 4 guests in the lodge. Ollie can not help in the lodge because he will try to get rid of the wolf. The police detective is Tino Balducci of the Last Train to Blue Moon Canyon game. Ollie will be in the Basement. Schedule your time - Be sure to do the maid duties early: Breakfast, housekeeping. Then proceed to do exploration. Come back to do lunch or dinner. If you missed any of the cooking duties, you will be scolded. Going outside - When the duties are done, be sure to check the weather indicator right of the main door. You can go outside indefinitely on Caution and carefully when it is on Danger. You can not go out on Extreme Danger. Time - If you have done all that can be done at that moment and need to move ahead to the next task, use the clock in Nancy's bedroom to move the time ahead. Turn the small hand until the hour you want to move the clock ahead to and then press the knob on top of the clock. Puzzles and actions - Most of the puzzles and actions can be done anytime depending on the game time schedule and the weather outside. Nancy's Bedroom: The inventory has Nancy's closet key (with tag) and the case file. Use the closet key to see that Nancy's suitcases are in there. Go to the right side table and look close. The clock can be used to change time in the game. Housekeeping - The employee instructions shows the Maid Duties. The daily cleaning: pick up laundry bag at front desk after 5:45 AM, clean the rooms that shows housekeeping sign, make the bed, remove used towels and washcloths. All these rooms have to be done before noon. The dirty laundry is to be dropped down the chute at the top of the stairs by the rest room. Skating Pond - Skating pond maintenance shows that the pond must be shoveled after every snowfall. Read the warning carefully. It mentions that there is some thin ice in the pond and only the safe parts are to be swept. The gauge below the page shows the ice thickness by the color. Place orange safety cone on the dangerously thin ice. Avalanches - Avalanches should be reported to the avalanche patrol. The phone number is added to the phone directory in the journal at bottom left of the screen. Sauna - The door to the Sauna sticks. Criminal activities - It should be reported to the Sheriff. The phone number of Sheriff Mahihkan is also added to the journal's directory. Cooking schedules are: Breakfast - 7 AM - 8:15 AM; Lunch - Noon to 1 PM and Dinner - 6 to 7 PM. There is a cooking manual in the kitchen. Take the master key left by Ollie and the room and guest list. Main desk: Exit the room and go down to the main desk. Computer - Check the computer. Employee Instructions - Review the check list similar to the paper in the bedroom. Guest Register - See the list of recent guests, hometown, phone numbers, room they occupied and check out. Click on the Previous Year at bottom left and see that it was deleted. Hypothermia Risks - See the color indicator for risks in going outside and getting hypothermia. See the Pinevale Hospital phone number. Birds - Check the birds that are seen here at the lodge during the different season. Fish - Check the fishes at the Icicle Lake that can be caught at the solar heated shack at the Lake. Note that Northern Pike is long, skinny, shiny and spotted. The Lake Sturgeon chews through fishing lines and has a pointed mouth. Closet - Pan back and open the closet at right. Take the laundry bag that is placed here after 5:45 AM. Elsa - Read the 3 crumpled papers seen in the closet to find out that Elsa, the former maid has 'L' boyfriend problem. Pull back and look at the crumpled paper under the desk with the fax machine. Read about insurance claim and see the phone number of Elsa Sibblehoth. Guest Rooms: Go upstairs. It's time to check-clean the guest rooms. The laundry chute is left of the bathroom. You might want to visit the bathroom once in a while. Chinook (fish) - First room on the left is vacant and is locked. Kwel Kwel (Owl) - First room on the right is Nancy's room. Eena (Beaver) - Lou Talbot's room is the second room on the left. Enter and check the room. The closet is locked. Go to right side of the bed and turn to click on the bed. This arranges the bed covers. Look at the paint tool box and pastel color paints on the floor right of the bed. Look at the books on the desk: USC Brea cover and Jack London's The Call of the Wild. See a fancy snow shoes on the chair at right. Go to the door and take the used blue towels at right. Kalakala (Bird) - Yanni Volkstaia's room is the second room on the right. Enter and check the room. The closet is locked. Go to the left side of the bed and do the bed. Read the magazine on the desk under the moose head. Learn about the possibility of the World Championship Cross Country Ski Competition to be done near here. Go to the door and take the used purple towels at left. Pish Pish (Lynx) - Bill Kessler's room is the last room at left. Enter and check the room. The closet is locked. Go to the right side of the bed and do the bed. Check the books on the table and chair: Structural Engineering, Rudimentary Geology and Large Machinery Safety protocol. Go to the door and take the used green towels at right. Ollalie (Grape) - Guadalupe Comillo's room is the last room at right. Enter and check the room. The closet is locked. Read the magazine on the table and see an article about Yanni from Fredonia. Read also how to fix a misaligned rifle sight at last page of the magazine. Go to the door and take the used red towels at left. Go to the end of the corridor and open the laundry chute. Drop the laundry bag in the chute. That's done. Let's go down. Display: Go to the table at the divider wall of the sitting room. See all of Trapper Dan's memorabilia and pictures. Pictures - Look at all the pictures on the wall and their labels and realize that Trapper Dan is quite a character. There are 2 missing pictures: Trapper Dan's Needle and the 'Young and Old Alike' picture. Necklace - Look at the colored stone necklace on the left of the table. Rexes Bone - The dinosaur bone is missing from the table's display. Snow shoes - The snowshoes used by Trapper Dan in 1900's is locked. Animal pyramid - Turn to the around and see a pyramid on the left table. It has animals depicted on the squares. We can check it later. Sitting Area: Go to the other side and see the nice fireplace. Newspaper - Read the Daily Moose newspaper on the table. Learn about Faringdale family's food poisoning from the potato salad. Bill Kessler and Lou Talbot at Fox and Geese table - Turn around and talk to the 2 male guests. Talk to Bill completely. Learn about the wolf and maybe the accidents. Bill wants Nancy to clean the ice pond so they can speed skate. Talk to Lou completely. His medium is dirt (but the paints in his room are pastels). Basement: Go down the basement using the door left of the stairs. Note that there is a cellar door to go outside right of the hallway from the stairs. Yanni - Talk to Yanni at far left corner from the stairs and right of the furnace. He's wearing a timer on his right arm. Sauna - Go forward to the sauna left of the furnace. Check it out. Ollie - Talk to Ollie beside the sauna in his workshop. Learn about the wolf and the missed shots. Freddie is his daughter and she has a secret in keeping warm. Chantal promised Ollie a raise. Main desk: Exit the basement and go up to the main desk. Telephone - Use the telephone and so some callings. Tino Balducci - Dial the phone number of Tino seen on the post it. Talk to him completely. Ned - Call Ned to say hello. The phone number is in the journal. Chantal - Call Chantal and talk to her completely. If you are close to noon, better start cooking. Lunch: Go to the door right of the display table at the sitting room. Setup - The covered plates and the order ticket are on top of the screen. The quesadilla are on the left. The raw burger patties, cheese, spinach, pickles, tomatoes and onions are on the small containers. The mustard, mayonnaise and paprika are above the griddle. Trash - The trash bin used for burned or error in cooking preparation is on the right. The griddle and frying pans are below the trash bin. Orders - The orders are random. Read the food order of each covered plate to know what each guest wants. Then either prepare each order individually or cook all the quesadilla or hamburgers first and prepare the trimmings of the burgers later - your choice. When each order is filled, click on the red square - Order Complete. Ollie will then take it automatically or you will hear him say if it is wrong. Hint - save the game after each order is correctly done. 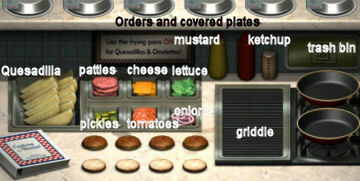 Manual - Read the cooking manual and learn how to cook the Quesadilla and the hamburgers. Quesadilla - Take a quesadilla and place it on the frying pan. Click the quesadilla cursor on the pile of quesadillas to clear the cursor. In a short time, the quesadilla will change color to light brown - so watch it carefully. Take it out and click it on the covered plate of the order you are preparing. If you make a mistake, a fire might occur. Hamburger - Take a hamburger patty and place it on the griddle. When it turns brown, take it and click it on the open bun. If you make a mistake, a fire might occur. Trimmings - Hint - Make a list of the trimmings order in a separate paper and work from that list: Cheese, lettuce, pickles, tomato, onion, mustard, ketchup. Click on the ingredients and then click it on the cooked hamburger patty as many times the order requires. Click on the next ingredient and the cursor will change to that ingredient. Be sure to click the last ingredient back on the original container to get it off the cursor. When done, click the finished burger on the covered plate. Click on the red square - Order Complete. Order up! 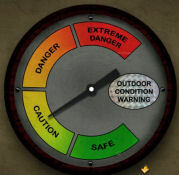 Outdoors condition: Before you exit the main door, check the weather indicator right of the door. If it is Caution working outside is okay. If it is Danger, watch the bar at top of the screen when you are outside. This will tell you when hypothermia is imminent. 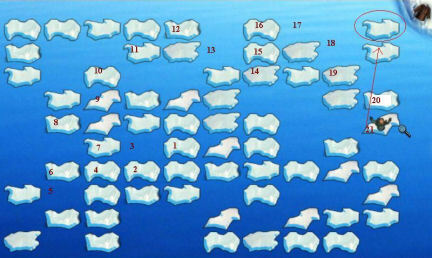 Skating Pond - This puzzle can be done on the first or the second day. Check to see if you have enough time to do the puzzle. Exit the lodge. Turn right, left at corner, forwards and left towards the skating pond. Shoveling snow - Save game here. Review the chart that was in the employee instructions. 0 Light blue shows that there are no thin patch of ice close by. 1 grayish blue shows that there is 1 patch of thin ice nearby. 2 Greenish blue shows that there are 2 patches of thin ice nearby. 3 Bright blue shows that there are 3 patches of thin ice nearby. Take the shovel at right side of the path to clear the pond. See that the area is shoveled by squares. Check each color of the square to be careful when doing the adjacent squares. Bottom right of the screen shows the shovel, warning cone and the number of cones or thin ice left. Place a warning cone on the thin ice you think is around or where Nancy fell in. Hints: Save after every correct area done so that you do not need to repeat from the start. Load from saved game whenever you fall through the ice. Do the edges first and watch out for the changes in color of the squares. Trapper Dan's Needle: After finishing the sweeping, Nancy sees wolf tracks and follows it to Trapper Dan's Needle. Click on the cloth that is sticking out of the base of the needle. Nancy makes a comment. Go left and follow the tracks to the right path. Chicken Ridge: Go forward and reach Chicken Ridge. Avalanche - Hear an explosion and then a wolf how. Nancy is trapped under an avalanche. She is running out of air. Someone is out there. Help is on the way. Ah... Meet the white wolf of Icicle Creek. The wolf hears something and leaves. Nancy exits the hole. Crater and fossil - Go forward a bit until a blackened area on the right. Go to right and see the crater made by the explosion. There's a fossil inside. Cool! Turn around, go right and forward to go back to the lodge. On the way, you might notice that some ski tracks on the snow have snowshoe prints over it. Go left at the corner of the lodge and enter through the door on the immediate right. Report the avalanche - Use the phone and call the Avalanche patrol to report. The phone number is in the journal. The man says to tell Ollie that the explosive training course is postponed. Ollie - Go down to the basement. Go left, left and talk to Ollie. He gives the snowmobile key to check for avalanches at Skookum Ridge. He mentions that Bill Kessler wants competition in ice fishing. Snowmobile - Exit the lodge. Go left, left at the corner and forward to the snowmobile behind Ollie's truck. Use the key on the snowmobile. Snowmobile ride - Click to follow the directions of the arrow. Be careful in hitting the trees, rocks and the snowman (eek!). At the ridge, go to the sign. Nancy checks for avalanches. Turn around and drive back to the lodge. Report to the Avalanche Patrol - Use the phone and call the Avalanche patrol to report. Ollie - Give the snowmobile key back to Ollie at the basement. Yanni - Talk to Yanni and learn about his thoughts about the bomb. 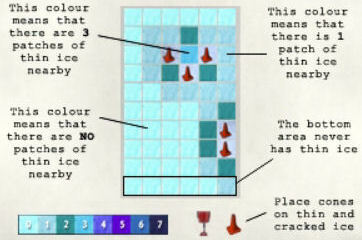 Bunk explosion - This puzzle can be done on the first or the second day. Check to see if you have enough time to do the puzzle. Let's check out the bunk explosion. Exit the lodge, go right, right and left across the stairs of the lodge. Snow Princess Freddie - Meet Ollie's daughter. She will not let you pass until you beat her in a snow ball fight. You must get 10 points. There is no win for you on a 10-10 score. Hit her on the face first and she can not hit back. You score a point. You can hit her and also get hit and both of you get a point. Remember where she appears and try to hit her in the face. Save the game before the fight. Load the saved game when you lose so that you don't waste good climate and time. Good luck. Bunk ruin - Go forward to the path ahead and it will split to the left and forward. Forward is the way to Icicle Lake and ice fishing. Go left and see the remains of the bunkhouse. Look at the clock buried in the snow. Looks like a lodge clock. Fishing shack - (Not really necessary). If you have time, go to Icicle Lake after the bunk ruin and check it out. Go back to the lodge. Main Desk: Time to use the phone again. Sheriff Mahihkan - After seeing the clock, call the Sheriff. Learn from the Sheriff about the explosion and that it is from a plastic explosive, C4. In Eastern Europe, it's called semtex. Learn the local thoughts about wolves. Carl Jenkins - Call Carl Jenkins about the accidents. The phone number is at the journal. Farindale - Talk to Mrs. Faringdale about the food poisoning. Derek Southwaite - Talk to the honeymooners and learned about the sauna accident. Sitting Room: Talk to Bill and Lou. If they are not around, wait until past 4 or 4: 30 PM or talk to them tomorrow. Fishing Dare - Bill dares you to catch a 2 footer Northern Pike. Check the computer's list of fishes to review what a Northern Pike looks like. 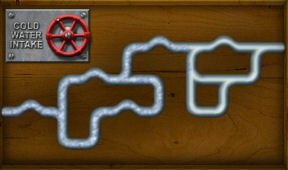 Fish Shack: This puzzle can be done on the first or the second day if you already have been given the fish challenge. Check to see if you have enough time to do the puzzle. Snow Princess - Beat Freddie again to pass through and then go to Icicle Lake. Save the game before the fight. Load the saved game when you lose so that you don't waste good climate and time. Fish Shack - Go forward until the Fish Shack. See that the place is trashed and the fishing gears are broken. Take the paper (bird magazine cover) from the floor and see a US phone number written on it. Freddie's Note - At the lodge foyer, pick up and read the red letter from the bench. Freddie will share her secret to keeping warm if you win the next snowball competition. Ollie - Talk to Ollie at the basement about the ruined fishing gears. He gives his tackle box. Dinner: Go to the door right of the display table at the sitting room. The salmons are on the left. The lettuce for the salad is below the salmons. The salad trimmings are beside them: eggs, yellow pepper, tomatoes, lettuce, anchovies, carrots, cucumber and croutons. Orders - The orders are random. Read the food order of each covered plate to know what each guest wants. Then either prepare each order individually or cook all the salmon orders first and prepare the trimmings of the salads later - your choice. Manual - Read the cooking manual and learn how to cook the Salmon. Salmon - Take a salmon and place it on the griddle. In a short time, it will change color to bright orange-pink - so watch it carefully. Salad - Take a lettuce from bottom left and place it on the bowl. Trimmings - Hint - Make a list of the trimmings order in a separate paper and work from that list: eggs, yellow pepper, tomatoes, lettuce, anchovies, carrots, cucumber and croutons. Click on the ingredients and then click it on the lettuce in the bowl as many times the order requires. When done, pick it up and the dressing is automatically added. Place it on the covered plate above. Sleep: You might need to sleep now. Go to Nancy's bedroom. Use the clock on the bedside table. Turn the white hand to 7 and then press the knob at top of the clock. The alarm rings and it is now 7 AM. Breakfast - Go down to the kitchen and prepare breakfast. The French toasts are on the left. The Canadian bacon is beside it. The omelet mixture is in a cardboard container above the griddle. The omelet fillings are beside the Canadian bacon: bacon, spinach, cheese, green peppers and olives. Manual - Read the cooking manual and learn how to cook French toast, Canadian bacon and omelet. French toast and Canadian bacon - Take a French toast or Canadian bacon and place it on the griddle. French toast cooks fast and should be golden brown. Canadian bacon should be lightly brown. Omelet - Take an omelet from the carton above the griddle and place it in the frying pan. Fillings - Hint - Make a list of the trimmings order in a separate paper and work from that list: bacon, spinach, cheese, green peppers and olives. Click on the ingredients and then click it on the top of the omelet in the frying pan, as many times the order requires. Click the omelet to fold it over and then place the omelet in frying pan on the stove. When done, pick it up and place it on the covered plate above. If there are any activities yesterday that were not done due to time, do them today! Snowball competition: Exit the lodge, right, right and left to the path across the stairs. Freddie - Compete with Freddie again. Save the game before the fight. Load the saved game when you lose so that you don't waste good climate. When you win, pick up the toasty pack, her secret to keeping warm. When you need another later, have another go with Freddie. Fish Competition: Go forward to Icicle Lake. Catch a 2 footer Northern Pike - Click on the fishing hole and see the hook at the top of the icy water. Click below (in an invisible straight line) the hook to the area where you want the hook to stay. Move away from logs, mines, beer cans and other fishes. Northern pikes are long, shiny, speckled and slim. The 2 footers usually stay at the bottom or sometimes middle of the lake. When you break a line, click on the hole again to fish anew. Save the game before fishing. Load the saved game when you catch non-essential things or other fishes so that you don't waste time. 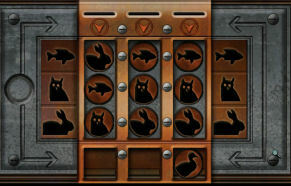 Easter Egg: Catsmom says: After you have caught the correct fish enter the bathroom. Listen to what Nancy says. You might have to enter and re-enter many times until she says to call Mystico for something amazing. Then go down to the lobby and call 1-555-mystico. Ask for something special. Then when the outside temperatures are right, head to the ice hut and go fishing. A Easter Egg will appear, Catch Easter Egg and head up to the locked room Chinook and walk inside. Surprise! Extra Egg... Go in Nancy's room and set the clock to 12am and have a scary dream. Thanks, catsmom. Ice floe: Exit the shack and someone in a dark ski suit hits Nancy with a snowball. An explosion follows and a wolf howls. 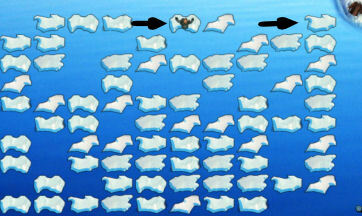 Ice floe puzzle - See that the ice broke into floes. Nancy lost her coat and is freezing. The wolf brings a coat to the shoreline. The aim of the puzzle is to stand on an ice floe that will raise the ice floe close to the shoreline where the coat is located. Note that standing in an ice floe will cause another to rise from or disappear into the lake. Step on ice floes all over and watch the shoreline by the coat to see if an ice floe appears. Stand on the ice floe where Nancy is located once or twice before the ice floe by the coat rises. You need to sink at least 5 times first. 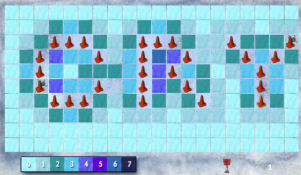 The blocks of ice are laid out in a grid pattern with horizontal, vertical and diagonal rows. If Nancy moves along a horizontal row, (eg hopping left to right) then random ice floes in that row will appear and/or disappear. If she moves in a vertical direction, then it will be ice floes in that column that appear and/or disappear. The same applies for diagonal rows. So the key is to jump along rows and columns until the ice floe in the top right corner appears (providing a stepping block to the jacket). Next you avoid jumping along columns/rows which include the corner floe until you are close enough to step onto it and off the lake. I jumped along the diagonal row linking the top right corner with the bottom left corner. When the corner floe appeared I then moved up and right in a step pattern, one floe at a time until I reached the corner. Take coat and find a note with a code in the pocket. Back to the lodge - Follow the wolf tracks until Avalanche Ridge. Then turn around and follow the ski tracks to get home. Mysterious phone number - Call the number seen in the paper (bird magazine cover) in the trashed shack - 202 555-7237. It is the Run and Grow Free organization that saves wildlife. Talk to Bill and Lou in the sitting room completely. Talk to Yanni in the basement. House keeping: Take the laundry bag from the closet at the main desk. Check the rooms that have housekeeping sign on the door handle. Check the other rooms too in case something is different. Kalakala (Bird) - Yanni Volkstaia's room is the second room on the right. Go to the left side of the bed and do the bed. Go to the door and take the used orange towels at left. Exit. Pish Pish (Lynx) - Bill Kessler's room is the last room at left. Go to the right side of the bed and see that other side of the bed has the covers folded. Do the bed. Check the bedside table and read the crumpled letter about Justice. Go to the door and take the used green towels at right. Exit. Lupe Comillo: This can be done the first or second day. Be sure to talk to her whenever you see her by the window. Go down to the display wall at the sitting room. See Guadalupe Comillo using binoculars by the window on the left. Talk to her completely and learn that the maid has been gone 2-3 days. She says that she is a birdwatcher. She sees hawk, eagle, orioles, cardinals and jays. She is very interested about the wolf. She has not been to the ice fishing shack. Check the birds in the computer and note that those birds Lupe stated are not seen here during winter. Call the Sheriff and talk about Yanni. Go to guest rooms to see if anything is different. Go to Lou's room and check the paint tool kit. A tool is gone. Go to Bill's room. Reread Bill's angry crumpled letter. On the way out from any guest room, hear an argument between Ollie and Lupe. Lupe is the one that messed up Ollie's rifle. (This can happen earlier or later depending on: if you talked to Lupe earlier and/or you cleaned Bill's room earlier). Easter Egg checked by gatorlaw: After hearing the fight bewteen Lupe and Ollie, go to the bathroom and hear the mystico comment. Go to the blown up fishing shack after passing Freddie and her snowball fight. Enter the 'intact' fishing shack and fish for the Easter egg. Go back to the lodge. Now you can enter the Chinook room and also get a dream by setting the alarm to anytime. The dream can be anytime as long as Nancy sleeps. Thanks, gatorlaw. Ollie - Talk to Ollie in the basement. See if you can find Freddie's note on the worktable - that read I will not throw Ice Balls at windows printed 10 times. Thanks, catsmom. Note - Go to the bench by the main door and see a note from Lupe. She wants Nancy to call her when she gets home. Explore outside: Exit the lodge. Trappers Dan's Needle - Go left and straight to Trappers Dan's Needle. Turn around and follow the wolf tracks to the right. Crater - Check the crater. See that the fossil rock is gone from the explosion crater. Go forward and left. Nancy will not go ahead - No more avalanches for me. Turn around and head back to the lodge. Enter the lodge to keep warm and get the top hypothermia bar to the right. Avalanche Creek - Exit the lodge after keeping warm. Go left, left at the corner of the lodge, left again at next corner and right to the path that has no sign. At Avalanche Creek, Nancy will not go ahead because of the avalanche, thick snow and too mush noise. She would need snow shoes. Turn around and forward until the lodge. You can go inside with no problem from hypothermia even if Nancy is shivering cold. Lupe - Call Lupe. Learn that she is a member of Run and Grow free. Also learn about wolves and other things. Chantal - Call Chantal and talk about Lupe. Ask about the snowshoes after going to Avalanche Creek and realizing you need one. She wants you to do a guest survey done by Tino before she gives you the combination to the snowshoes lock. Call Ned only if you have time. Tino's Survey - Call Tino and he will fax the survey. Look at Tino's Guest Survey in inventory. What? Side of the bed? Hometown? Planet? Paprika? Sherlock Holmes, he's not. Go around and talk to: Talk to Yanni at the basement; Bill and Lou at the sitting room. Call Lupe to get information only after talking to the male guests. The side of the bed can be checked during the housekeeping duties or recall. Check where the slippers are located and where the bed covers are turned over. Type in: GC (Guadalupe) - left; LT (Lou) - (type in any answer - left or right or both), BK (Bill) - right; YV (Yanni) - right. The hometown info is in the computer. GC - Los Angeles; LT - Brea; BK - Toronto; Yanni - Eladsaet. GC - Earth; LT - X; BK - Mars; YV - Pluto. If you have too much time left before dinner. Use the clock to advance the time for dinner at 6 or use the phone to call people. Dinner: Do dinner. Add paprika to the salad after the croutons. Ozzie will say that Bill doesn't like paprika (senior) or Lou (junior level). Paprika can be added during cooking. (If you do the paprika addition during lunch, add it to the burger fixings. If during dinner, paprika can be added to the salad.) By default, Lupe's can be any answer. GC - (type in any answer - best to type no); LT - Yes (junior); BK - Yes (senior); Yanni - No. After typing in the answer, call Tino. Automatically, fax the survey. Tino gives his analysis. Hahahaha. Tino gives the snowshoes lock code - 7669. McQuade's Shack: Time to check where the wolf track goes. Snowshoes - Go to the display table at the sitting room. Enter 7669 on Trapper Dan's snowshoe lock. Avalanche Ridge - Exit the lodge. Go left, left at the corner of the lodge, left again at next corner and right to the path that has no sign. After the Avalanche Ridge sign, use the snowshoes. See it at top left of the screen. Go forward following the wolf tracks. Hear a shotgun blast and a wolf howl. After hearing the shotgun blast, look left at a dark crater. Pick up the notebook left of the crater. Read it later when out of the cold. Turn right and continue forward until the shack. You might or might not need to use the toasty pack given by Freddie to keep warm. Shack's lock - Look close at the lock on the shack door. 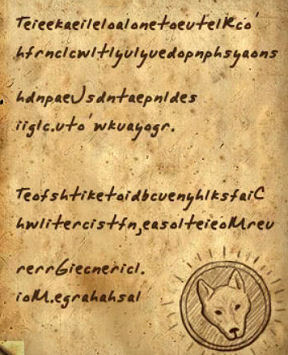 Enter the lock code deciphered from the note inside the pocket of the coat given by the wolf. Inside the shack - Go forward and look around. Notebook taken from crater - Read the notebook taken from the crater and see that someone has the taken pictures of the dinosaur bones in the lodge and also the drawing of the missing rexes bone. Diary - Take and read the diary of the man that lived here in the shack - Julius McQuade. Learn about the wolf, Isis and how they interacted. Isis follows commands. She can also sort objects by scents by dropping the object near another object with the same scent. Isis saved Julius' life by bringing a heavy coat when he got lost in the storm; just like what she did to Nancy. He got sick and went to Pinevale hospital. Isis - After reading the diary, meet Isis. Click on Isis to calm her down. Toasty packs - Take a toasty pack from the cupboard on the table. Pan right and get another toasty pack from the cot. Take the weird thing from top of the sack also. It has a phone number on it - 334 555 7625. Bone key - Go left of the cot and see that there's an indentation on the wall shaped like the rex bone in the lodge. Exit and hear an explosion. Go forward back to the lodge. Use a toasty pack when needed. Lodge - Read a note on the bench by the coat rack. Someone wants to meet Nancy at the sauna. Call Pinevale Hospital to find out what happened to Julius McQuade. Ollie - Go down to the basement. Go to Ollie's workbench and get a red rug. Go to where Yanni does his work. Pick up the piece of paper in front of his work bench. It reads: Leave this place now or be prepared to leave it forever. Go back upstairs and get the laundry bag from the main desk's closet. Place the laundry bag in the chute by the bathroom. Isis test - Go back to Isis at the shack pass Avalanche Ridge. Exit the lodge. Go left, left at the corner of the lodge, left again at next corner and right to the path that has no sign. After the Avalanche Ridge sign, use the snowshoes. Go forward until the shack. Give the notebook with pictures to Isis. She holds it in her mouth. Then click Ollie's rag and each of the guest's washcloths (Bill K, Yanni V, Lou T) on the floor or on Isis. The cloth is placed on the floor. The positive scent is shown by Isis dropping the notebook in her mouth on the cloth with the same scent. It's Lou Talbot's notebook. Go back to the lodge. Tino's report - Read the report found on the bench by the coat rack. Tino said that Lou Talbot was arrested for digging up dinosaur bones from private property. If there is time fix lunch, if past lunch time - that's okay. Sauna time: Find out who sent that mysterious note about a sauna meeting. Go down to the basement. Enter the sauna. See the missing pictures of a young boy. That mark on his face. Very familiar! Locked in the sauna - The door to the sauna was locked. Save Game here. Immediately turn around from the door and click on the top of the right bench to expose the pipes. Timed puzzle! 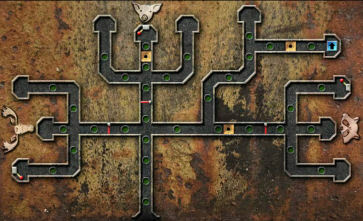 Turn the pipes to form a complete connection to allow water to flow. Donna says: Face the sauna door. Just keep clicking as fast as you can on the locked door. Eventually the game will say "Nancy Faints". But you are not knocked into second chance. You then have unlimited time to complete the puzzle. Thanks, Donna. 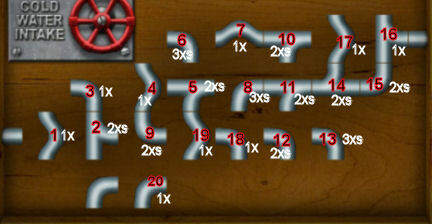 Red colored numbers are the order of the pipes to be clicked on; the white colored numbers are the number of turns or clicks. Bill opens the sauna door. In the sitting room, Bill talks about his past. His grandmother owned the lodge before Chantal's father bought it 2 years ago. He mentions that the pyramid by the display has a secret compartment that would open when only pigs are seen. The compartment has a master key that opens the Needle. Call Chantal and ask about Bill's grandmother. Find out what really happened. Pyramid: Go to the pyramid on the table by the display and kitchen door. Pig pyramid puzzle - Look close at the pyramid. The object of the puzzle is to have all the pictures be turned to show only pigs. 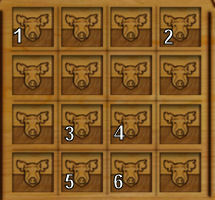 Turn the squares in the order shown until a pig is seen on the clicked square. The compartment opens. It's empty - no master key. Talk to Bill again. If he's asleep, wake him up. He mentions that his Granma Tilly said that if you turn the top of the pyramid 45 degrees and fill the outside with one kind of an animal until all 4 animals are done, you will find Trappers Dan's journal. Raccoon, Wolf, Pig and Moose puzzle - Go back to the pyramid. Click on the top of the pyramid. Look close on the pyramid. See that the pictures of the animals are seen at the base. The aim of the puzzle is to light up all the animals. It doesn't need to be in order shown. But in our solution it is best to start with raccoon, then wolf, then pig and lastly the moose. 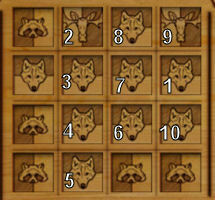 First the raccoon: Turn the squares in the order shown until a raccoon is seen on the clicked square. 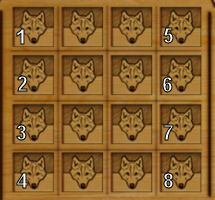 Second the wolf: Turn the squares in the order shown until a wolf is seen on the clicked square. 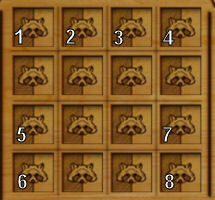 Third do the pig: Turn the squares in the order shown until a pig is seen on the clicked square. Lastly do the moose: Turn the squares in the order shown TWICE. All the animals at the base are lit, the secret drawer opens. Take Trapper Dan's journal. Trapper Dan's Journal: Read the journal of Daniel Weisnitz. He mentions you need to have an intelligent creature like his Mary, the pig to crawl through small spaces, jump and have paws or hooves to move levers. 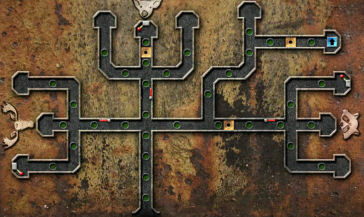 See a picture of the maze to get to his vaults. Trapper Dan gives clues on how to get inside his Needle in case the magnetic key is lost. 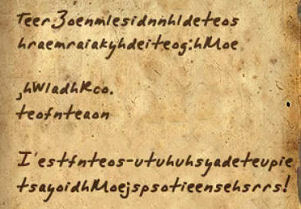 First thing to do is crack my cipher - Look at the coded sentences. bone and use it in the wall of my hideout. That'll open up my secret lock. It's easy to find the moose - just push out his eye and see the surprise! hiding place. Just don't wake up any lodgers. Moose key - It's easy to find the moose - just push out his eye and see the surprise! Go upstairs to Yanni's room (Kalakala, the bird). Enter and look at the moose head right of the door. Click on the moose's eye. A secret compartment opens. Take the moose disk and look at the radio. Click the radio on and there's a foreign talking man that sounded like asking a question. Go down and talk to Yanni at the basement about the radio. Raccoon key - The fire necklace will tell you all you need to open up the sly raccoon's hiding place. Just don't wake up any lodgers. Go back up and take a look at the fire necklace at the display table. Take note of the colors of the disks. Go back up to the guest rooms. Look close at the colored wedges above the doorknobs. They can be changed to different colors. Change the colors of the wedges above the doorknobs to be the same as that of the fire necklace. Hear a click. Look at the picture of the raccoon between Eena and Chinook door. The eyes glow. Click on the raccoon's nose and get the raccoon disk. Lou - Talk to Lou at the sitting room. After the talk, he gives his closet key to Nancy. Go upstairs to Lou's room (Eena). Use the key on the closet and take the rex bone. Trapper Dan's Vault: Go back to the shack past the Avalanche Ridge. Look around. Take the Geiger counter under the cot that Isis uses as a chew bone. ...find my rex bone and use it in the wall of my hideout. That'll open up my secret lock. 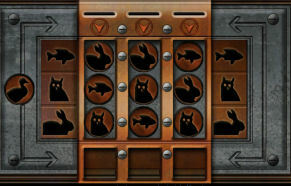 Fish Owl Rabbit (Slot Machine) puzzle - Go to the corner and place the rex bone on the indentation. The slot machine Trapper Dan mentioned in his journal is activated on the door on the left. The aim of the puzzle is to have all fish at top row, all owl on middle row and rabbit at bottom row. Use the duck counter to match up all 3 animals. There is a duck disk on the left to move the disks down. It helps to first put the same animals in a column and work from there. Place duck disk back to left disk slot. Vault Maze: Enter the secret mine passage until the end. Look around and see a ladder at left corner that goes up to another level above and a wood stand with metal lid on the right. Open the metal lid and see the map of the vault maze. Remember the entry in Trapper Dan's journal, it states that your animal should be able to jump over pits and has paws or hooves. Study the map: see the moose vault to the left, pig vault on top and raccoon vault to the right. The gold squares are pits and the red lines are bars. The red circle at each end must be the levers. There is one passage at top right that goes up. Where does that go? Pig key - Remember another entry in the journal - that Mary (key) can be found above the vaults. Let's look for the pig key then. It is at the end of the second floor. Mary helps hold the rope above the vaults taut once she goes through the maze. That must the passage that goes up at top right of the map. Pull back and see Isis. Isis commands - Isis is smart and can go through the maze like Mary. Study the path to upper right of the maze map. The gold metal is a pit. Click on Isis and see a command frame appear. Select the commands to give her. Then end the command with 'go'. Forward, right, left, right, jump, go. See Isis enter the tunnel and her progress in the map. Hear some machinery like an elevator. That must be the up arrow at the end of the map. Top level - Go left, forward and then turn around. Go to top left corner. Climb the ladder at the corner. Go forward until the path goes right and left. Needle door - The left path goes to a door with the 4 animals and coin slots. It has the needle pictured on top left. This must be the door to get to the needle where we need the 4 animal disks. Turn around and go back. This time let's take the other passage. Go left when you see arrows on the right wall. Rope - Go forward and see Isis sitting by a rope. This must be the rope mentioned in the journal to get to the pig (Mary) key. There's a dumbwaiter at the end. That must be the way Isis came to this level. Look up and see the rope on the pulley. Click on the rope pulley and Isis holds the end of the rope taut in her jaws. That must be how Mary did it too. Go back to the shack by turning around, left, down the ladder, forward until the shack and out the door. Walk back to the lodge. If it is late, Nancy will stay here for the night. You have to order Isis to do the rope again the next morning. Boar's head - Immediately, go to the guest bedroom hallway. Do not stop to talk to anyone - Isis can not hold that rope taut indefinitely. Hahahaha. Go to the end and see the boar's head mounted on the wall. Click on the open snout and take the pig disk. 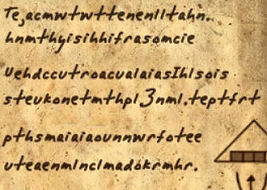 Wolf key - The wolf is the trickiest to find because only the likes of Marie Curie or Mr. Geiger can hear his call. Go down to main floor. Go right and go to the left side of the kitchen door. See a high reading by the dinosaur bones stool-decor beside the stand with the lamp. Interesting. Another positive reading on the display table is seen. Go down to the basement, go forward after the stairs. Get another high reading, after the stairs to the cellar door. Face the stairs and get the highest reading. Click on the bottom step. Open the bottom step and get the wolf disk. Talk to Ollie in the basement and learn that you don't need to cook anymore because Lou flew the coop. Happy days are here again! 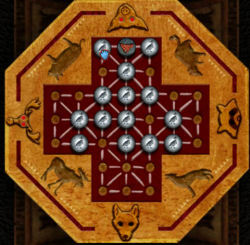 Fox and Geese Game - Remember the vault maze map has red gates barring the animal passages. We need to remove that. The clue to this is in the drawings in the journal of the fox and geese. Play the Fox and Geese game with Bill. Use the pig disc to replace the fox disk. Mary always had a fox's cunning about her. You have to play and win the game 3 times: corner the fox-pig on the moose corner, pig corner and the raccoon corner. Move the geese around until the fox is cornered in the area you need. The strategy is to herd the fox (pig) by surrounding him with the geese squares placed one square away from the fox (pig). Move the pig area geese down and slowly surround the opponent. Leave a space on the area you want to herd the opponent in (usually the corners). The side area geese that is not in play might need to be moved to the fox area to block the opponent going-hiding back there. When you get close to the opponent be sure that it can not jump over the goose so that the goose is taken out. Some sacrifices might need to be done to herd it in the corner though. Be sure to have the back and sides of the goose covered. The win makes the eye of the animals glow and the bars in the vault maze will be removed. Isis and the levers - Go back to the shack now that we have all 4 animal disks and have lowered the bars. Study the path to each animal lever. Command Isis to go to each red knobbed lever. Another command is needed in an intersection. Moose - forward, left, left, paw, go. Pig - forward, forward, forward, jump, paw, go. Raccoon - forward, right, forward, jump, left paw, go. Needle gate - Climb the ladder and go forward. At the intersection, continue forward (not the lit path at right). 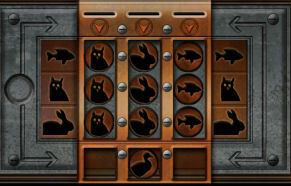 Place the collected animal disks in the coin slots. Click on the door and enter Trapper Dan's Needle. Needle - Look around. See a black snowmobile outfit that has a tear. Check the UC Brea backpack ahead. Wow - it's loaded with plastic explosives -C4. Hear Yanni come in. He will go for help. End chase: Ollie arrives in his snowmobile. Click on the snowmobile and give chase to the villain. Keep him in sight and as close to him as you can. You cannot overtake him or catch him. Wait until he gets into an accident. 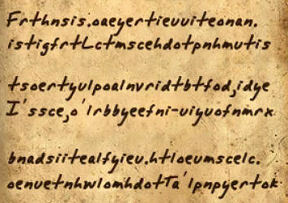 Next Nancy Drew Adventure - Legend of the Crystal Skull.